English follows after Japanese below. First, through expressing my works and attitude toward daily working, my position and direction on the history of Japanese woodworking were clarified. Second, on the basis of what my work is, a short history of Japanese wood working was noted. Of course, my stance for publishing is that of one of fine wood workers, but at the same time, I emphasized the necessity for academic research of fine wood working: Moku-kougei itself and its history. Japan, which has various types of wood, has a long history of woodworking, fostered and handed high technique on the following generations. However, on the other hand, few types of academic research have been done. 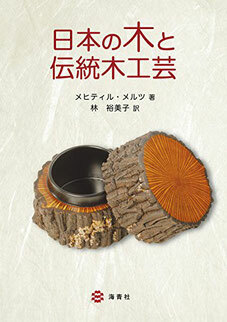 One book breaking such a situation has been published ―“Wood and Traditional woodwork in Japan”http://www.kaiseisha-press.ne.jp/cat.pl?type=view&RecordID=1471929848. Originally it was published in English edition and has been republished in translated edition into Japanese by Kaiseisha press. The author is German researcher Dr.Mertz, who got apprenticed in Meister and passed the exam for it and later mastered art history of Eastern Asia, anatomy of wood material and ethnobotany. She is a quite excellent researcher to understand both technique and theory of wood working, and has deep knowledge of wood material. It's so pleasuring for us Japanese woodworkers that she got interested in Japanese woodworking with long history and this research has been done based on her deep knowledge. This research begins with clarifying world standard name of woods; scientific name. In writing, always I also pay attention to this point and tried to do best for putting down bottom note in my book in order to be scientific toward wood material, but through her deep knowledge for various languages, she distinguishes wood names along standard Japanese name, dialect and popular name addition to scientific name into English, German and French. The list for materials and that about techniques in three languages are breakthrough to enable researchers in the world to discuss on the same stage. The highlight of this research is about interaction between wood materials and products including products and works. Woodworking tackles natural materials, so even in making for the same purpose or in the same style, different works could be made, but just in that difference this research tries to discover traits common in Japanese fine woodwork. I admire and agree with her academic insight that found the essence of Japanese wood working is based on deep knowledge and efforts in utilizing the characteristics of wood, which means deep thought toward materials is core-value for making what Japanese fine wood workers are. Furthermore, of course with supports of Japanese people, I take off my hats to the fact that this research is based on the huge audio data in non-native language toward her. Primary responsibility for such research should be assumed by researchers of its own country: Japan, but few ones have done, which is present miserable state surrounding today’s Japanese woodworking. I tried to show what generality is in Japanese woodworking through expressing how my working is different from others, but on the other hand Dr.Mertz is oriented to far-reaching research to discover traits literally “common” to many wood workers and people involved with wood material. Especially, original edition was written in English, so it will serve as the basic textbook for enthusiasts and researchers interested in Japanese wood working. Western-Japan despite main theme is the uniqueness of each area, which may be because in Japan she is academically based on Kyoto-university. Especially it is incomplete that there is no mentioning about the development of modern wood working based on Tokyo and material mulberry coming out of Mikurajima-island: far South bound from Tokyo but the area of it. Addition to it, woodworking style should be noted not only from commercial aspects that based on The 'Law for the Promotion of Traditional Craft Industries' but from art and craft unique in Japan: Kögei. I think the relationship between wood and Japanese aesthetics is found not in commercially oriented attitude but in Kögei style. In total, this book is amazing to be a bridge between cultural science like aesthetics and art history, and natural science like botany, which is of course from the author’s deep knowledge about both of those academic fields. To Japanese woodworkers, I recommend it so as to grasp where our working styles are on. Oh my goodness! Awesome article dude! Thanks, However I am encountering difficulties with your RSS. I don't know why I can't join it. Is there anyone else having the same RSS problems? Anyone who knows the answer can you kindly respond? Thanx! !